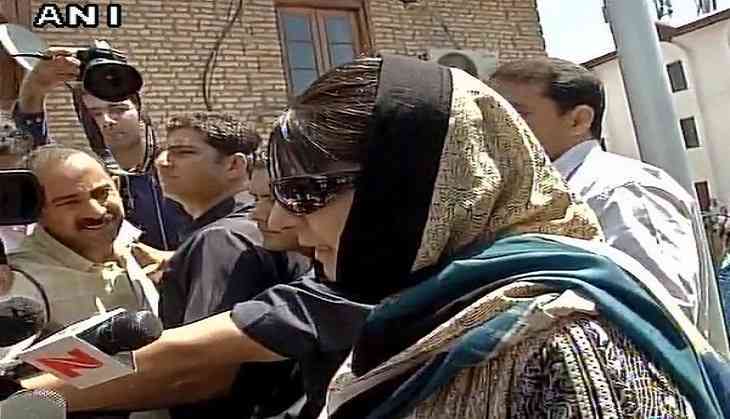 Branding the lynching of Deputy Superintendent of Police (DSP) Mohammed Ayub Pandith as a 'shameful' act, Jammu and Kashmir Chief Minister Mehbooba Mufti on Friday warned the people of the state to not test the patience of the security forces, who use restrain in dealing with locals. "Nothing can be more shameful than to kill someone who works for the welfare of the people. The Jammu and Kashmir Police are showing maximum restrain as they are dealing with their own people, but for how long? Someday when they will lose their patience, then it would become very difficult for the people," Mufti said after attending the wreath laying ceremony of Pandith here. Mufti further stressed that the Police were deployed to protect the lives of the locals, but if they continued behaving like this, then it's possible that the past may return in which security forces use maximum force on people. Last night, Pandith was lynched to death by a violent mob in downtown Srinagar. The deceased DSP was allegedly on surveillance and was clicking picture of people emerging from the Jamia Masjid mosque, when a mob attacked him. After the situation became out of control, the cop in his own defence open fire through his service pistol on the mob, in which three people got injured. The angry mob then proceeded to attack him more severely and ended up taking his life. Police have recovered the body of deceased and are investigating the matter.